Are You Ready for the Change in the Market? How to Estimate Repairs the Right Way! Is Real Estate Flipping Right For You? Technology vs. Relationships – Which Matters More in Real Estate? Written by Daniil Kleyman, real estate developer, software entrepreneur, and occasional writer. I’ve been thinking about the topic of real estate technology vs real estate relationships for a while, so thought I’d share my thoughts as it relates to investing. Real estate has always been an “inefficient information business”, meaning the really juicy information that allows people to make money is not readily available to everyone. Doing research, hitting the streets, being creative and able to create value where nobody else sees it, has always allowed people to make large profits. I’ve always loved real estate because you can actually buy something BELOW today’s market value. Think about it. And try comparing that to the stock market, for example. Profits in real estate have always gone to people with information that others don’t have and relationships that others want. Case in point: you find an off-market abandoned commercial building, buy it for $100k, renovate for $300k, lease it out to a start-up restaurant and the building is now worth $600k. You just built $200k in equity and a nice cashflow stream from the restaurant. Profits went to you and not someone else because you found something that others didn’t know existed and negotiated a deal that others couldn’t. But we are living in a time of absolutely incredible technological change. The cloud, mobile devices in every hand, wifi everywhere, informational infiniti at your fingertips – and we’re just getting started. Every industry from taxis to TV to travel is getting revolutionized by technology. And real estate is no exception! There’s new real estate technology that makes it easier than ever for investors to find deals, analyze them, connect with other investors, sell their deals, outsource work to VAs half a world away, and do more faster and better. My company, True Vision Analytics, not only produces our own technology platforms (Rehab Valuator, Rental Valuator) but we have started Angel Funding other real estate technology platforms as well! As of writing this, we are getting ready to launch a completely revamped cloud-based Rehab Valuator platform with enhancements and features that would have been impossible to launch a few years ago! (stay tuned). As for angel funding and venture capital, Tenant Turner was the first such company we invested in. They’re a local company out of Richmond, VA that make it much easier for management companies and leasing agents to lease out their properties without having to take phone calls or answer emails. They recently got accepted into Y Combinator and are growing market share very quickly! I am now evaluating other start-ups in the real estate space for seed investment. There’s no question – real estate technology platforms can significantly enhance your ability to do deals and make money. Real estate will always, to some degree, be an “inefficient information business”, no matter how much technology evolves. There will always be information and opportunities that will not be publicly available. And deals – especially bigger deals – will always be done between people who have real relationships between each other. The real profits will ALWAYS go to people that go out, find off-market opportunities rather than the low-hanging fruit, and figure out how to take advantage of those off-market opportunities creatively. Technology is hugely powerful and I implore you to use it and learn it. But it will be an enhancement to your real estate business, not a driving force behind it. To expressly rely on any one real estate technology or platform to build and run your business is a huge mistake and you will ultimately fail. Go out and build relationships. Get to know people. Get to know buyers, sellers, developers, agents, brokers, title companies, business owners, private lenders, bankers, etc. Those real estate relationships, carefully and patiently cultivated will bring you profits. Not the fancy new software platform you just signed up for, even mine. Again – that software will help! But don’t ignore the same fundamentals that have made this business amazing and profitable for centuries and will continue to do so for centuries to come. Building relationships in business is important! The market that I am active in – the market where I currently have 20+ development projects either active or in permitting – I know very intimately. I know or make an effort to know virtually every local player, big or small. Wholesalers, rehabbers, brokers, developers, business owners, etc. It’s these relationships that ensure I get brought deals first by wholesalers. It’s these relationships that ensure I know of every development happening locally and how it may affect my own projects. It’s these relationships that ensure I get great tenant and seller referrals from other professionals. It’s these relationships that ensure I have virtually unlimited bank and private money at my disposal whenever I need to pull a trigger on a deal. It’s these relationships that ensure I get a heads-up about deals before they hit the market (MLS, Loopnet, etc). None of this has come from a magic website somewhere. It came from getting to know people, shaking hands, helping them grow their businesses first and foremost, connecting them to other relationships, etc. So get off your Facebook, LinkedIn, Twitter, or whatever other website you spend entire days on. Go take some people to lunch and ask how you can help them. Go hit the streets, find off-market opportunities that other people don’t know about. And then use your real estate relationships to put deals together that create inefficient, outsize profits – precisely because this business is one of the few that still allows you to do this! We are fortunate to be associated with the RE bizz and your operation! As merchants of real property, we have millions of dollars worth of inventory we do not have to buy first in order to sell! Right on, Truett! Always good to hear from you btw! a very true point. Tech is a tool. I bet similar deals can be rocked within the OTC markets? Excellent article. I totally agree with you. My biggest problem is finding the time and the people. Thank you Daniel, you are right on. Keep up the great work! I am a National VP of Construction for a large multi family developer and operator. I have been in the business for approx 20 years and I have to agree that technology is a compliment to our business, however it cannot replace the core fundamentals of the RE business. Bottom line this is a people business and relationships that provide partnerships and value cannot be replaced by technology. I am a jack-of-all-trades software engineer with a lot of web development experience. I have had an interest in real estate investing almost as long as I have had an interest in computer programming. Do you know of any opportunities for me to shift my software engineering into the real estate investing space? great post. The people part of real estate is fun AND rewarding, emotionally AND financially. Great post Daniil, you are so right even with all the crazy software and technology out there, you still need good relationships for success. I am currently using your new Rehabvaluator software which is awesome, to dabble in the commercial arena, but the people I am dealing with I’ve known for 10 or more years. You are spot on with this blog. Great thoughts… Thank you for sharing your wisdom. I always believed in the motto: You can achieve anything in your life if you help others to get what they want. Look forward to learning more from you, Daniil. Thank You Daniil, for your wisdom and knowledge about relationships, that’s encouragement to continue to take action in REI. Have a wonderful day, and ongoing success in your REI business. Thanks, Tommy! Appreciate the compliments and definitely have lots of good stuff in the works! The contents of the blog are indeed some secrete behinds successful business. It is a great and hidden knowledge`s blog. You are spoton. 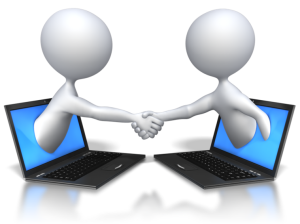 Face to face, real communication is so instrumental.My feeling is no matter what technologyis available, it is trust,that builds relationships in business. Tech has also given into unscrupulous bad business activity that leads to a tremendous amount of non-trust in real estate and in business in general. Personally, i think until you make face to face contact with someone and have a relationship, e-mail and text takes a back seat. Hello Daniil, I have followed you for a while, I have been in the business of Real Estate and finance since I was 19 years old, now age of 57. You are definitely a out of the box thinker and the only way you can achieve the things you have shared is because you must love it like I do. So many things you put out there will separate a Real Estate and financial person from a marketer in the Real Estate business and to me it is like two separate profession, I know a lot of people that make a great living in real estate marketing and really have no idea about the Real Estate Business, I have had issues with Real Estate sales people not wanting to forward the contract to seller because the creative part of the business they have no clue how to present to seller and instead of learning they will say that the seller will not accept, my theory is why be in such a fascinating business and only understand marketing, to me I am not a marketer and consider myself a Real Estate deal maker not a Real Estate deal breaker, by no means am I degrading someone in the business that makes a lot of money being great in marketing but to me it takes all the fun out of creating things that others have not and others that have but to take from them and maybe take another step that makes it even better is thinking out of the box. I have always said that two minds are better than one, You are the type of gentlemen that I would love to brainstorm with. I believe you are doing a great job on how you approach the business, I truly know you have to love the business as well to promote the things you do because in the Real Estate Business I have never been in the Real Estate Market where you cannot make things happen, It’s knowing on what side of the coin you are on at the time, putting that together with understanding finance and thinking out of the box is the ultimate and the most fun. What I love the most is when you continue to get sellers to pay you to buy Real Estate and walk out of the closing with $2,000 to $200,000 in your pocket. Daniil, I’m sure you have helped many many people in the business, I do believe like you do that people like yourself have to have some kind of gift, I would like you to tell me you agree or give me your feelings. I am challenging a project that is new to me in last 2 years, mobile home parks, working on one that to a lot of people it is over priced by $200,000, I know it is a great deal, first of all, I’m structuring to put money in my pocket to buy once again, at a 3% interest rate given by the seller and her moving into second position, letting her control 50% of the $200,000 and releasing monies as she sees the monies going back into the property and myself taking the park to a 5 star level from a one star level in due time is conservative to say that a $600,000 purchase price can be a 3 million dollar property in less than 5 years with a maximum of total investment of another persons money of $400,000 having excellent exit plans depending on the market which is a property that is really not effective by the market except in a positive manner with an unreal income stream paying 3% on part of the money averaging a total 5 to 6 % interest rate and constructively being conservative on my numbers. I also have a lot of experience in Building as well which will help me when instead of putting more money into remodeling the older park models, junking the total unit leaving only the frame of mobile to pacify and meet all State and local codes. I really enjoy what you are doing and if you are in to these kind of deals I would enjoy to talk to you and brainstorm being that I have more than I can handle and surely have never had a issue with sharing deals with others because of the fact there are so many of them out there that are available with about any make sense offer. Once again I can truly see the joy you are having in doing what you are doing and always continue to think out of the box. Great Blog! enjoying the new software (I will send an update soon) as a trained communicator, I would say, you sir, could not be more accurate! !